1. Inaugural lunch, Grand Hotel, Cape Town 20th November 1952. Mitchell Coutts; KLM; Ellerman and Bucknell; African Car Hire; African Tourist; Thomas Cook; SABENA; Wilson Collins; Sturrocks; Parry Leon; Union Castle; South African Railways; Automobile Association; Farrell Line. The formation of Skal Club was unanimously approved. It was unanimously decided that the fees would be:- Entrance Fee of 3 guineas and an Annual Fee of 2 guineas. Sir Mile Thomas, Chairman of BOAC was to be the first guest speaker at the general meeting and lunch on 27th January. The Club was officially founded as Skal International, Cape Town, Club 109. The Constitution and Rules were approved. The Post Office Box and the bank account opened at Barclays Bank. Lunches were decided as the first Tuesday of each month.Members must assemble at 12h30pm and the function must terminate at 2pm, precisely. The Inaugural Function was discussed. It was felt that, whilst an evening social occasion would be pleasant, the apathy of Cape Town to such functions was well known and it was considered very doubtful that an evening function could be organised properly. It was decided that the Inaugural Function should be in the form of a luncheon to be held at the Grand Hotel on Tuesday 3rd March1953. The first letterhead was used. It was resolved to make a charitable donation of One Guinea per month to the Service Dining Rooms. On the Inaugural Lunch, although all agreed that although the arrangements and service were very good, the quantity of the food left much to be desired and were not up to the standard Club members had a right to expect. 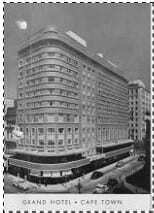 It was agreed that the Treasurer should interview the General Manager of the Grand Hotel on the matter. A letter has been received from AISC, accepting the Cape Town Club as No. 109 under the foundation date of 27 January 1953. It was decided that as the June lunch would be taking place during Coronation Week, the guest speaker would be the Commander-in-Chief, South Atlantic. It was discussed with management of Grand Hotel that the luncheon price be reduced to 5/6d inclusive of tips. It was agreed that the Secretary should be paid £1:10/= per month for payment as a typist for Skal work. The Treasurer reported that the bank balance reflected £166:8:11d and he was authorized to open an Investment Account in the Cape of Good Hope Savings Bank. The GM of Arthur’s Seat Hotel offered to host the Christmas lunch. For the January lunch, Lord Jowitt, President of the British Travel & Holidays Association and Lord Chancellor in the last Labour Government would be the guest speaker. It was decided to continue the one guinea per month donation to the Service Dining Rooms. A donation of five guineas was made to the Greek earthquake disaster fund. On a question from the floor whether consideration be given to have lady members on the committee. The Chairman replied that it was not a committee matter it was for the members to decide. 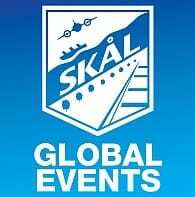 Today Skål Cape Town has 148 members and has had a very successful history where members from all sectors of the Tourism Industry are able to network and in many cases experience the benefits Skål has to offer.